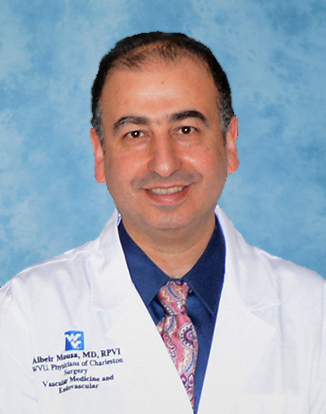 CHARLESTON, W.VA. – Albeir Y. Mousa, MD, FACS, RPVI, MPH, MBA, professor of surgery at the WVU School of Medicine Charleston campus, has been selected as part of the inaugural class of the Academy of Master Surgeon Educators, a program created by the American College of Surgeons (ACS) to continually advance the science and implementation of education—teaching, learning, assessment, and scholarship—across all specialties of surgery through innovation and promotion of the highest achievements in lifelong learning. This prestigious academy was created in 2014 to recognize and assemble a cadre of renowned master surgeon educators who will work closely with the ACS Division of Education, to advance the science and practice of avant-garde surgical education and training. Dr. Mousa is one of two surgeons selected for the academy from hundreds of applicants. Academy members are selected through a rigorous peer-review process and induction into the Academy will be a very high honor. The goals of the Academy include defining megatrends in surgical education and training; steering advances in the field; fostering innovation and collaboration; supporting faculty development and recognition; and underscoring the critical importance of surgical education and training in the changing milieu of health care. Academy membership will be open to master surgeon educators from across the surgical specialties. Academy members represent master surgeon educators from across the surgical specialties and will be expected to actively engage in activities to address the Academy’s goals. “This is one of a series of remarkable milestones for Dr. Mousa, who represents so well the many talented and accomplished faculty members on the WVU School of Medicine Charleston campus,” said John C. Linton, PhD, ABPP, associate vice president for health sciences and dean of the school of medicine at West Virginia University’s Health Sciences Charleston Campus.